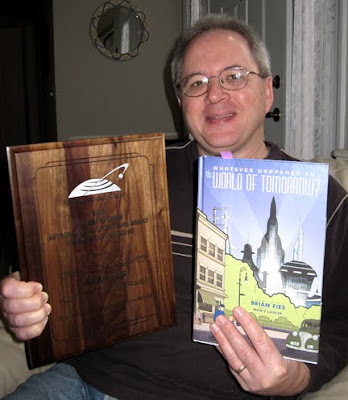 My postal carrier briefly interrupted the stream of junk mail and Christmas catalogs that jam our mailbox this time of year to bring me something I actually wanted: a handsome plaque from the American Astronautical Society (AAS). 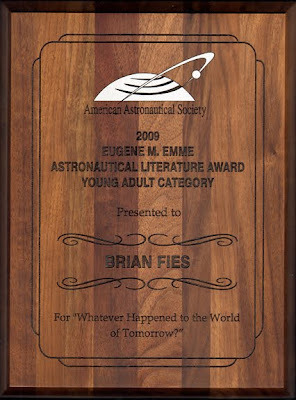 My Eugene M. Emme Astronautical Literature Award, Young Adult Category, for Whatever Happened to the World of Tomorrow. You can tell I'm happy because of my totally relaxed and natural smile in the photo above. What a goober. Pretty cool, huh? Thanks again to the AAS, not to mention (nor ever overlook) all the people who read and appreciated WHTTWOT in the first place. That's better than plaques. Which I will still take. This is full of Win! and Awesome! Being recognized by space professionals has got to be a particular thrill. Very well-deserved and a handsome addition to your laurels. I like the part about how you don't have to get it framed because it's like its own frame. Seriously, this is truly a well-deserved award. Tom Kelly's Moon Lander and William Burrows's This New Ocean are two other Emme recipients, and I'm glad to see you've been recognized for your work, which is definitely of the same caliber. Congrats, Brian! This is where working at home becomes a disadvantage. After all, how many people wander by your desk in an average ... decade? Maybe you could mount it on your front door. Let's see...the number of people who've wandered by my desk in the past decade is about...eight. Nine if you count Pastis. But not many people wander by my front door, either. Honestly Mike, I can't help thinking of your admonition that "plaques are for haques" when one actually shows up at my door. I think I disagree. Some mean more than others.